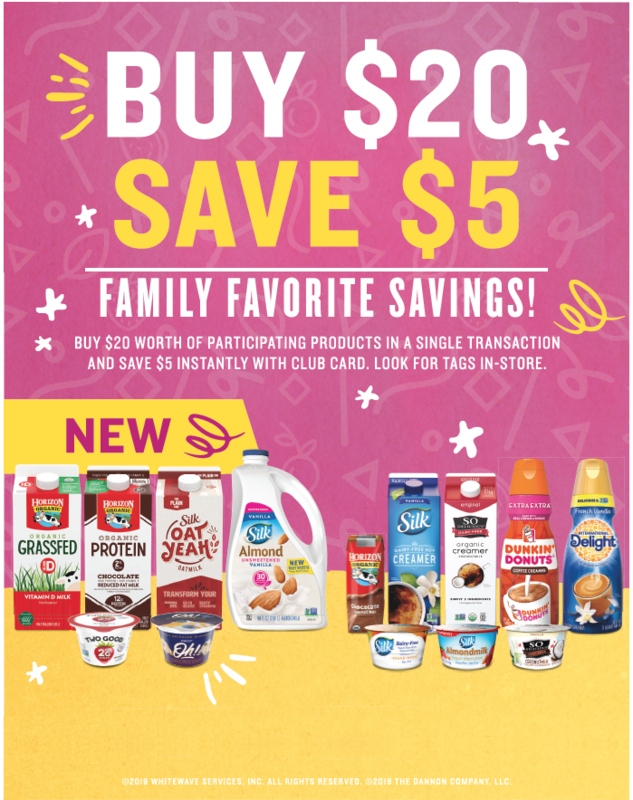 Safeway has a HOT new promotion happening in the dairy aisle this month – save $5 instantly when you spend $20 on participating Dannon and Whitewave products. This is a great time to stock the refrigerator with your favorite dairy and plant-based milks, creamers and yogurts. The promotion does not include the entire line of Dannon and Whitewave products, rather it’s focused on the newest additions to the Dannon/Whitewave family! Two Good Greek Yogurt – with only 2 grams of sugar, this high protein Greek yogurt is almost too good to be true! Available in blueberry, peach, strawberry and vanilla flavors. Oikos Oh! Yogurt – creamy, indulgent double-cream yogurt available in four delicious flavors including Lemon Sweet Cream Delight, Magnificent Mixed Berry Rhubarb, Salt-Dusted Caramel Crème and Honey Drizzled Blueberry. Horizon Organic has launched new grass-fed organic milk and protein organic milk that you can try – with 12 grams of protein, it’s the only high protein organic milk on the market! 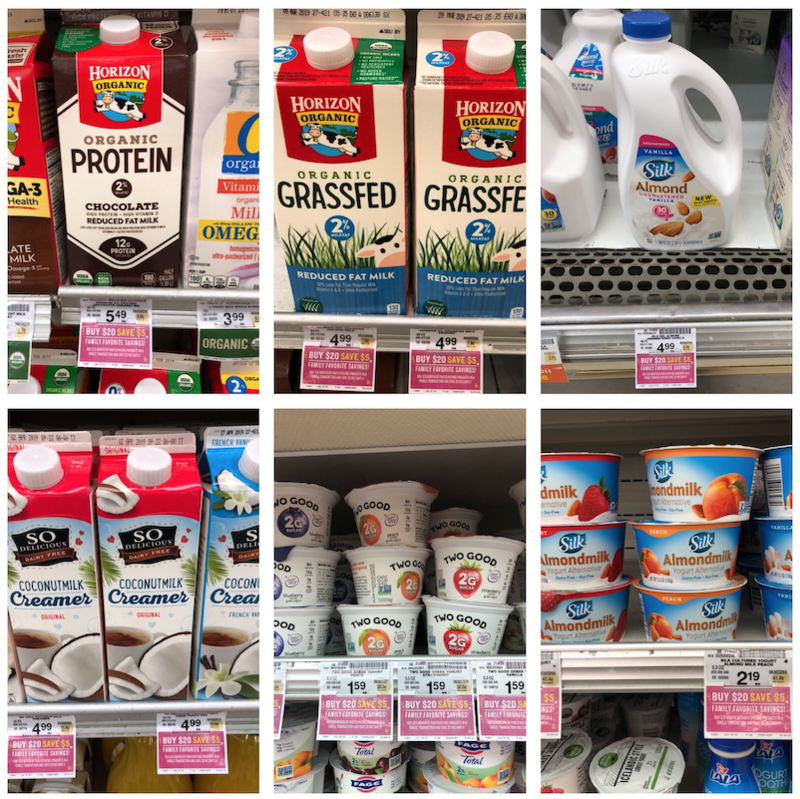 Silk has a new Oat Yeah oat milk that is a part of this promotion and they just recently added the new 96 oz size Silk Almond Milk to Safeway stores – great news for almond milk fans. See below for the list of participating products and you’ll also see a pink tag on the items in the store that trigger the instant $5 savings when you spend $20! If you are new to a plant-based lifestyle, be sure to check out 15 easy plant-based recipes you can follow for healthy eating here. The great part of this promotion is that you can stack the $5 instant savings offer with coupons for even bigger savings! There are several Just for U Digital Coupons and cash back offers on ibotta that you can pair with the promo. Just remember that the $20 threshold must be met after digital coupons. Mix and match any of the following products to spend $20 and you’ll save $5 instantly! Dannon purchased Whitewave in April of 2017. 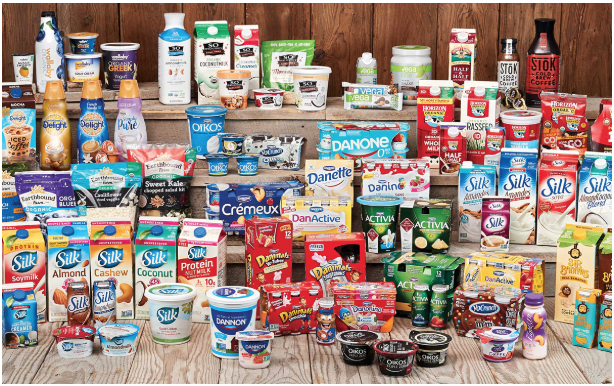 The dairy conglomerate was originally called DannonWave and later dropped the Whitewave name a year after the merger in April 2018. The brands and products under the combined Danone entity that has a headquarter in Broomfield, CO as well as White Plains, NY, include Dannon, Silk, Horizon Organic, Activia, Light & Fit, Danimals, Oikos, International Delight, Earthbound Farm, So Delicious, Vega, Land O Lakes Creamers, Dunkin Donuts Creamers, Stok Cold Brew Coffee and Wallaby. 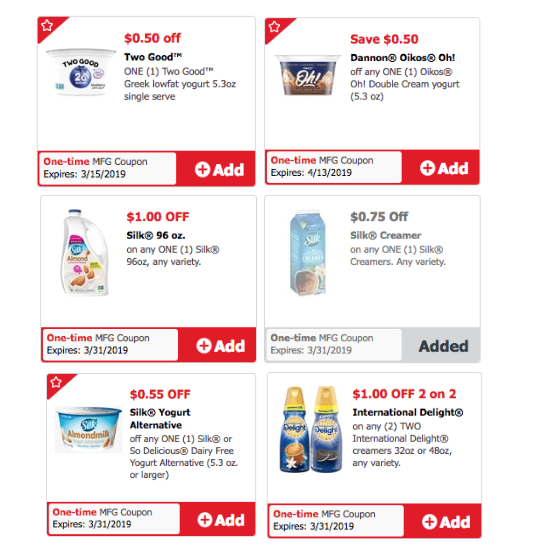 See all the printable coupons that match this promotion as well as new Dannon Oikos Yogurt Coupons in the widget below. Select all the coupons you want for easy printing! Super Safeway is a blog devoted to helping you find the best deals at Safeway in the Denver division. Every week we slice and dice the ad and tell you the best deals at Safeway with and without coupons. For more low prices, check out Super Safeway’s weekly ad coupon matchup page. Want to stay updated on the best deals? If so, make sure to like Super Safeway on Facebook, follow us on Twitter, Instagram, and subscribe to our newsletter.